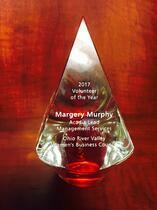 Margery M urphy, President of Acadia Lead Management Services, was named Volunteer of the Year by the Ohio River Valley Women’s Business Council (ORV~WBC). Each year, this award recognizes an outstanding individual who has volunteered their time for committee work or conferences, or served in a support role in his or her market. Marge received this award April 19th at the 8th Annual Catch the Wave Conference in Louisville, KY. The Catch the Wave Conference brings female entrepreneurs and business owners from Ohio, Kentucky and West Virginia together to network, learn and gain inspiration from each other. Margery and Acadia have won several awards in recent years, including Top 65 Fastest Growing Dayton Business, 2014 ORV~WBC Advocate of the Year and Women to Watch in Sales Lead Management. Acadia continues to grow as the company expands and relocates to a new downtown office this summer. Acadia specializes in helping B2B companies reach new levels of success in sales and marketing. Acadia is a Gold Partner with HubSpot, a cloud-based marketing automation and sales platform. Acadia is a WBENC-certified firm, with other services including lead development, sales and marketing consulting, market research, contact list builds and database management. Contact Acadia today for more information.